Need to move a car from Philadelphia, PA to Memphis, TN? Memphis is a major American city in the State of Tennessee, with a population of over 670,000 residents. 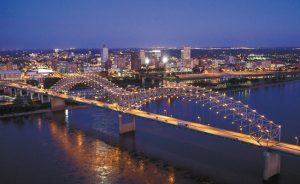 It is a great place for music lovers as Memphis is considered the birthplace of rock’n’roll, blues, and soul. Here, at Sun Records, legendary musicians like Elvis Presley and Johnny Cash recorded their hits. Besides its rich musical heritage, Memphis has much more to offer. Here you can try famous barbecued ribs. You can also enjoy sunny weather, art galleries, and vibrant nightlife. If you have chosen Memphis as your new home, it is a good idea to order car transport services to move your car. Our team is always here to help you with shipping your vehicle from Philadelphia, PA to Memphis, TN! The drive from Philadelphia to Memphis is not the shortest. The distance is over a thousand miles and you would have to spend over 15 hours driving in order to move your car. That is not only a lot of time spent behind the wheel but also a lot of money spent on gas and possibly motel bills. The good thing is that you can avoid all this hassle by shipping your car. Philadelphia Car Transport is your reliable auto shipper delivering all types of vehicles door-to-door. We will be happy to ship your car from Philadelphia to Memphis and help you avoid any unnecessary stress of moving a vehicle. Our company guarantees the high quality of our services while staying as affordable as possible. Need a car transport quote? Get a free estimate by requesting it on our website or calling our office during business hours. Our agents will be glad to provide you with a quote and all the information you need!